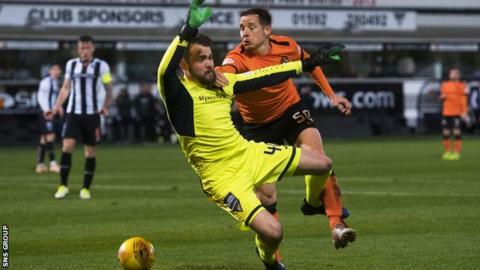 Dundee United narrowed the gap on Scottish Championship leaders Ross County to two points with a dominant display against Dunfermline Athletic. Peter Pawlett drove from near halfway, leaving a trail of defenders behind him, to slot in the opener. Pavol Safranko was a real menace for the visitors, going close with headers on four occasions, with the last hitting the crossbar. Pawlett also had a first-half shot well saved by the busy Ryan Scully. A third consecutive league win was thoroughly deserved by Robbie Neilson's side, who have now played two more matches than County in the race for automatic promotion. Queen of the South visit Tannadice on Saturday, while the Dingwall team go to Alloa Athletic. Match ends, Dunfermline Athletic 0, Dundee United 1. Second Half ends, Dunfermline Athletic 0, Dundee United 1. Corner, Dunfermline Athletic. Conceded by Paul Watson. Corner, Dundee United. Conceded by Ryan Scully. Tom Beadling (Dunfermline Athletic) wins a free kick in the attacking half. Substitution, Dunfermline Athletic. Myles Hippolyte replaces Louis Longridge. Substitution, Dundee United. Nicky Clark replaces Paul McMullan. Substitution, Dunfermline Athletic. Matthew Todd replaces Ryan Blair. Corner, Dunfermline Athletic. Conceded by Ian Harkes. Louis Longridge (Dunfermline Athletic) is shown the yellow card. Corner, Dundee United. Conceded by Lee Ashcroft. James Craigen (Dunfermline Athletic) wins a free kick in the attacking half. Substitution, Dunfermline Athletic. Faissal El Bakhtaoui replaces Kallum Higginbotham. Substitution, Dundee United. Samuel Stanton replaces Peter Pawlett. Callum Booth (Dundee United) wins a free kick in the attacking half. Pavol Safranko (Dundee United) hits the bar with a header from the centre of the box following a corner. Bruce Anderson (Dunfermline Athletic) wins a free kick on the right wing. Attempt blocked. Paul McMullan (Dundee United) right footed shot from the right side of the box is blocked. Corner, Dundee United. Conceded by James Craigen.